The Greater Washington Board of Trade approached WCM with the desire to elevate its magazine, OPPTY. This publication encompassed news and articles of note to its members. WCM produced a special themed edition centering Washington as the thought-leader of cybersecurity. The content wove information presented at the client’s cyber conference with interviews with area experts. 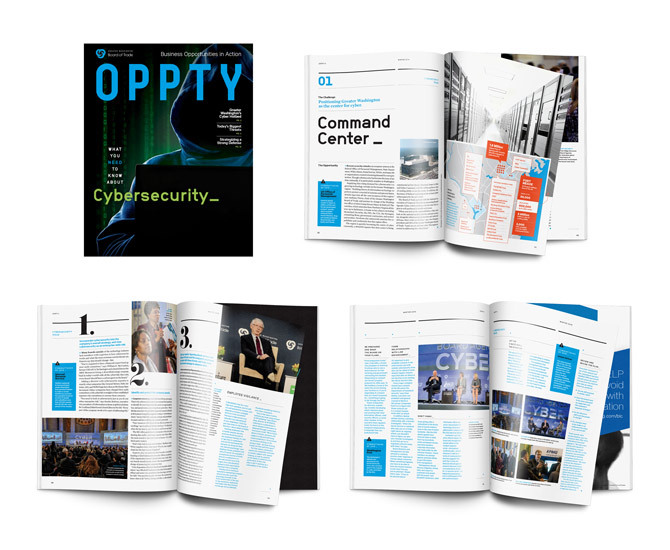 The redesigned OPPTY transitioned from its traditional 4-cover topic cover to a single bold image and bright color scheme that continued throughout the publication. The five subtopics were designed as chapters for easy-to-follow narratives. Each article contained call-outs, sidebars, and a highlighted example of a company or organization that experienced a security breach. The magazine blended information, photos and infographics to convey the gravity of the situation.